I wasn't always in love with Colton Calloway; I was in love with his younger brother, Kyle, first. Kyle was my first one true love, my first in every way.Then, one stormy August night, he died, and the person I was died with him.Colton didn't teach me how to live. He didn't heal the pain. He didn't make it okay. He taught me how to hurt, how to not be okay, and, eventually, how to let go. ***Nell Hawthorne is in love with her life-long best friend, Kyle Calloway. Their young love is invincible and life is full of promise; then one night Kyle dies suddenly in a tragic accident and Nell is forever changed. She meets Kyle's older brother Colton for the first time at the funeral. They both struggle to move on with life as best they can. Years later, they meet again in New York City, and Colton realizes that Nell has never really gotten over Kyle's death. She seems to be harboring a deeply rooted pain, a heavy weight of guilt and regret. He knows he shouldn't get involved, but he can't help himself. Trust doesn't come easily for either of them, and they both have demons. Together, they learn the purpose of pain and the meaning of healing, and the importance of forgiveness. 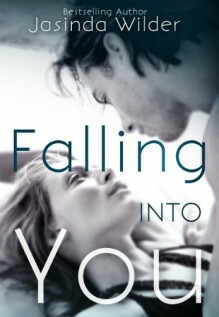 ***Excerpt from Falling Into You: It was just a single sob at first, a quick, hysterical inhalation. Then a second. And then I couldn't stop it. Tears, a flood of them. I felt the sand grow cold and muddy under my face, felt my body shuddering uncontrollably. He didn't tell me it was okay. He didn't try to pull me against him or onto his lap. He kept his hand on my shoulder and sat silent next to me. I knew I wouldn't be able to stop. I'd let go, and now the river would flow un-dammed. No. No. I shook my head, clenched my teeth, lifted up and let myself fall down hard, sending a spear of pain spiderwebbing out from my arm. The pain was a drug, and I accepted it greedily. It was a dam, stemming the tide of tears....Full length (80,000 word) New Adult Contemporary Romance: **Mature Content Warning** 17+ for language, and adult situations. HEA ending. Never cried so much reading a dang book! Keep the tissues handy for this one. Piękna książka, łezka uroniona. Szczerze polecam.